Grand Prairie, TX – October 29, 2015) In honor of National Breast Cancer Awareness Month, NEBO, a global flashlight brand, partnered with the National Breast Cancer Foundation for a special campaign to promote awareness and raise funds. Fueled by the generosity of their customers, NEBO is proud to announce a donation of $32,000 to the National Breast Cancer Foundation, whose mission is to provide help and inspire hope to those affected by breast cancer through early detection, education, and support services. Beginning in late September, NEBO offered the Lucy2 Pink Work Light for the campaign that included a special in-store counter display. Proceeds from every sale of the Lucy2 were donated to NBCF. 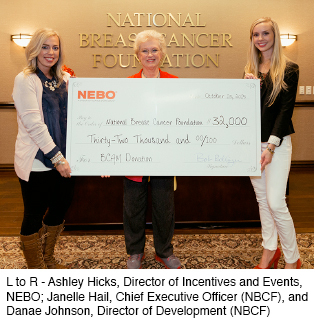 The culmination of the campaign was on October 22, 2015, when NEBO presented a check to National Breast Cancer Foundation at their Frisco, Texas headquarters. "We were so proud of our partnership with National Breast Cancer Foundation to support a great cause,” said Ashley Hicks, Director of Incentives and Events at NEBO. “The success of our campaign was due to our great customers and our highly motivated, prominently female sales force, who whole-heartedly got behind this campaign to support National Breast Cancer Awareness Month."